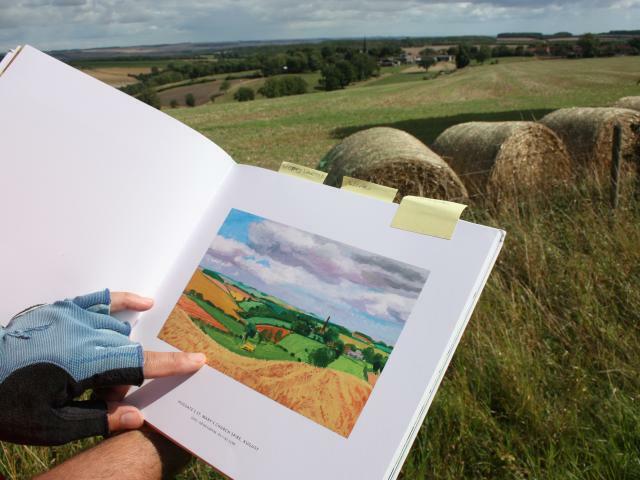 David Hockneys’ show of vivid and large scale East Yorkshire landscape paintings at The Royal Academy of Arts in London is proving a hit. Way of the Roses crosses East Yorkshire, and more particularly the Yorkshire Wolds, between Stamford Bridge and Bridlington, and passes through Huggate village (134.5 miles) where a teenage Hockney came from Bradford to work on a farm for two summers stacking corn. “I cycled all over it” he’s quoted as saying, “and cycling you do realise it’s quite hilly”. Variously painted Woldgate is part of the route running into Bridlington where the artist now spends much of his time. On the route in its Old Town is Gallery 49, which sells Hockney prints and the work of other local artists. If the Yorkshire Wolds inspires you too, then its new 150-mile circular route could be your next cycling adventure. The Royal Academy show lasts to the 9th April.